There are three basic strategies for biological pest control: classical (importation), where a natural enemy of a pest is introduced in the hope of achieving control; inductive (augmentation), in which a large population of natural enemies are administered for quick pest control; and inoculative (conservation), in which measures are taken to maintain natural enemies through regular reestablishment. Natural enemies of insect pests, also known as biological control agents, include predators, parasitoids, pathogens, and competitors. Biological control agents of plant diseases are most often referred to as antagonists. Biological control agents of weeds include seed predators, herbivores and plant pathogens. The term "biological control" was first used by Harry Scott Smith at the 1919 meeting of the Pacific Slope Branch of the American Association of Economic Entomologists, in Riverside, California. It was brought into more widespread use by the entomologist Paul H. DeBach (1914–1993) who worked on citrus crop pests throughout his life. However, the practice has previously been used for centuries. The first report of the use of an insect species to control an insect pest comes from "Nanfang Caomu Zhuang" (南方草木狀 Plants of the Southern Regions) (ca. 304 AD), attributed to Western Jin dynasty botanist Ji Han (嵇含, 263–307), in which it is mentioned that "Jiaozhi people sell ants and their nests attached to twigs looking like thin cotton envelopes, the reddish-yellow ant being larger than normal. Without such ants, southern citrus fruits will be severely insect-damaged". The ants used are known as huang gan (huang = yellow, gan = citrus) ants (Oecophylla smaragdina). The practice was later reported by Ling Biao Lu Yi (late Tang Dynasty or Early Five Dynasties), in Ji Le Pian by Zhuang Jisu (Southern Song Dynasty), in the Book of Tree Planting by Yu Zhen Mu (Ming Dynasty), in the book Guangdong Xing Yu (17th century), Lingnan by Wu Zhen Fang (Qing Dynasty), in Nanyue Miscellanies by Li Diao Yuan, and others. Biological control techniques as we know them today started to emerge in the 1870s. During this decade, in the US, the Missouri State Entomologist C. V. Riley and the Illinois State Entomologist W. LeBaron began within-state redistribution of parasitoids to control crop pests. The first international shipment of an insect as biological control agent was made by Charles V. Riley in 1873, shipping to France the predatory mites Tyroglyphus phylloxera to help fight the grapevine phylloxera (Daktulosphaira vitifoliae) that was destroying grapevines in France. The United States Department of Agriculture (USDA) initiated research in classical biological control following the establishment of the Division of Entomology in 1881, with C. V. Riley as Chief. 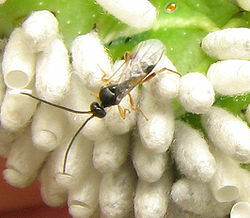 The first importation of a parasitoidal wasp into the United States was that of the braconid Cotesia glomerata in 1883–1884, imported from Europe to control the invasive cabbage white butterfly, Pieris rapae. In 1888–1889 the vedalia beetle, Rodolia cardinalis, a lady beetle, was introduced from Australia to California to control the cottony cushion scale, Icerya purchasi. This had become a major problem for the newly developed citrus industry in California, but by the end of 1889 the cottony cushion scale population had already declined. This great success led to further introductions of beneficial insects into the USA. In 1905 the USDA initiated its first large-scale biological control program, sending entomologists to Europe and Japan to look for natural enemies of the gypsy moth, Lymantria dispar dispar, and brown-tail moth, Euproctis chrysorrhoea, invasive pests of trees and shrubs. As a result, nine parasitoids (solitary wasps) of gypsy moth, seven of brown-tail moth, and two predators of both moths became established in the USA. Although the gypsy moth was not fully controlled by these natural enemies, the frequency, duration, and severity of its outbreaks were reduced and the program was regarded as successful. This program also led to the development of many concepts, principles, and procedures for the implementation of biological control programs. Prickly pear cacti were introduced into Queensland, Australia as ornamental plants, starting in 1788. They quickly spread to cover over 25 million hectares of Australia by 1920, increasing by 1 million hectares per year. Digging, burning and crushing all proved ineffective. Two control agents were introduced to help control the spread of the plant, the cactus moth Cactoblastis cactorum, and the scale insect Dactylopius. Between 1926 and 1931, tens of millions of cactus moth eggs were distributed around Queensland with great success, and by 1932, most areas of prickly pear had been destroyed. The first reported case of a classical biological control attempt in Canada involves the parasitoidal wasp Trichogramma minutum. Individuals were caught in New York State and released in Ontario gardens in 1882 by William Saunders, trained chemist and first Director of the Dominion Experimental Farms, for controlling the invasive currantworm Nematus ribesii. Between 1884 and 1908, the first Dominion Entomologist, James Fletcher, continued introductions of other parasitoids and pathogens for the control of pests in Canada. To be most effective at controlling a pest, a biological control agent requires a colonizing ability which allows it to keep pace with changes to the habitat in space and time. Control is greatest if the agent has temporal persistence, so that it can maintain its population even in the temporary absence of the target species, and if it is an opportunistic forager, enabling it to rapidly exploit a pest population. One of the earliest successes in the west was in controlling Icerya purchasi (cottony cushion scale) in Australia, using a predatory insect Rodolia cardinalis (the vedalia beetle). This success was repeated in California using the beetle and a parasitoidal fly, Cryptochaetum iceryae. Other successful cases include the control of Antonina graminis in Texas by Neodusmetia sangwani in the 1960s. Alligator weed was introduced to the United States from South America. It takes root in shallow water, interfering with navigation, irrigation, and flood control. The alligator weed flea beetle and two other biological controls were released in Florida, greatly reducing the amount of land covered by the plant. Another aquatic weed, the giant salvinia (Salvinia molesta) is a serious pest, covering waterways, reducing water flow and harming native species. Control with the salvinia weevil (Cyrtobagous salviniae) and the salvinia stem-borer moth (Samea multiplicalis) is effective in warm climates, and in Zimbabwe, a 99% control of the weed was obtained over a two-year period. Augmentation involves the supplemental release of natural enemies that occur in a particular area, boosting the naturally occurring populations there. In inoculative release, small numbers of the control agents are released at intervals to allow them to reproduce, in the hope of setting up longer-term control, and thus keeping the pest down to a low level, constituting prevention rather than cure. In inundative release, in contrast, large numbers are released in the hope of rapidly reducing a damaging pest population, correcting a problem that has already arisen. Augmentation can be effective, but is not guaranteed to work, and depends on the precise details of the interactions between each pest and control agent. An example of inoculative release occurs in the horticultural production of several crops in greenhouses. Periodic releases of the parasitoidal wasp, Encarsia formosa, are used to control greenhouse whitefly, while the predatory mite Phytoseiulus persimilis is used for control of the two-spotted spider mite. The egg parasite Trichogramma is frequently released inundatively to control harmful moths. Similarly, Bacillus thuringiensis and other microbial insecticides are used in large enough quantities for a rapid effect. Recommended release rates for Trichogramma in vegetable or field crops range from 5,000 to 200,000 per acre (1 to 50 per square metre) per week according to the level of pest infestation. Similarly, nematodes that kill insects (that are entomopathogenic) are released at rates of millions and even billions per acre for control of certain soil-dwelling insect pests. The conservation of existing natural enemies in an environment is the third method of biological pest control. Natural enemies are already adapted to the habitat and to the target pest, and their conservation can be simple and cost-effective, as when nectar-producing crop plants are grown in the borders of rice fields. These provide nectar to support parasitoids and predators of planthopper pests and have been demonstrated to be so effective (reducing pest densities by 10- or even 100-fold) that farmers sprayed 70% less insecticides and enjoyed yields boosted by 5%. Predators of aphids were similarly found to be present in tussock grasses by field boundary hedges in England, but they spread too slowly to reach the centres of fields. Control was improved by planting a metre-wide strip of tussock grasses in field centres, enabling aphid predators to overwinter there. Cropping systems can be modified to favor natural enemies, a practice sometimes referred to as habitat manipulation. Providing a suitable habitat, such as a shelterbelt, hedgerow, or beetle bank where beneficial insects such as parasitoidal wasps can live and reproduce, can help ensure the survival of populations of natural enemies. Things as simple as leaving a layer of fallen leaves or mulch in place provides a suitable food source for worms and provides a shelter for insects, in turn being a food source for such beneficial mammals as hedgehogs and shrews. Compost piles and stacks of wood can provide shelter for invertebrates and small mammals. Long grass and ponds support amphibians. Not removing dead annuals and non-hardy plants in the autumn allows insects to make use of their hollow stems during winter. In California, prune trees are sometimes planted in grape vineyards to provide an improved overwintering habitat or refuge for a key grape pest parasitoid. The providing of artificial shelters in the form of wooden caskets, boxes or flowerpots is also sometimes undertaken, particularly in gardens, to make a cropped area more attractive to natural enemies. For example, earwigs are natural predators which can be encouraged in gardens by hanging upside-down flowerpots filled with straw or wood wool. Green lacewings can be encouraged by using plastic bottles with an open bottom and a roll of cardboard inside. Birdhouses enable insectivorous birds to nest; the most useful birds can be attracted by choosing an opening just large enough for the desired species. In cotton production, the replacement of broad-spectrum insecticides with selective control measures such as Bt cotton can create a more favorable environment for natural enemies of cotton pests due to reduced insecticide exposure risk. Such predators or parasitoids can control pests not affected by the Bt protein. Reduced prey quality and abundance associated increased control from Bt cotton can also indirectly decrease natural enemy populations in some cases, but the percentage of pests eaten or parasitized in Bt and non-Bt cotton are often similar. Predatory lacewings are available from biocontrol dealers. Predators are mainly free-living species that directly consume a large number of prey during their whole lifetime. Given that many major crop pests are insects, many of the predators used in biological control are insectivorous species. Lady beetles, and in particular their larvae which are active between May and July in the northern hemisphere, are voracious predators of aphids, and also consume mites, scale insects and small caterpillars. The spotted lady beetle (Coleomegilla maculata) is also able to feed on the eggs and larvae of the Colorado potato beetle (Leptinotarsa decemlineata). The larvae of many hoverfly species principally feed upon aphids, one larva devouring up to 400 in its lifetime. Their effectiveness in commercial crops has not been studied. Several species of entomopathogenic nematode are important predators of insect and other invertebrate pests. Phasmarhabditis hermaphrodita is a microscopic nematode that kills slugs. Its complex life cycle includes a free-living, infective stage in the soil where it becomes associated with a pathogenic bacteria such as Moraxella osloensis. The nematode enters the slug through the posterior mantle region, thereafter feeding and reproducing inside, but it is the bacteria that kill the slug. The nematode is available commercially in Europe and is applied by watering onto moist soil. Predators including Cactoblastis cactorum (mentioned above) can also be used to destroy invasive plant species. As another example, the poison hemlock moth (Agonopterix alstroemeriana) can be used to control poison hemlock (Conium maculatum). During its larval stage, the moth strictly consumes its host plant, poison hemlock, and can exist at hundreds of larvae per individual host plant, destroying large swathes of the hemlock. For rodent pests, cats are effective biological control when used in conjunction with reduction of "harborage"/hiding locations. While cats are effective at preventing rodent "population explosions", they are not effective for eliminating pre-existing severe infestations. Barn owls are also sometimes used as biological rodent control. Although there are no quantitative studies of the effectiveness of barn owls for this purpose, they are known rodent predators that can be used in addition to or instead of cats; they can be encouraged into an area with nest boxes. Parasitoids lay their eggs on or in the body of an insect host, which is then used as a food for developing larvae. The host is ultimately killed. Most insect parasitoids are wasps or flies, and many have a very narrow host range. The most important groups are the ichneumonid wasps, which mainly use caterpillars as hosts; braconid wasps, which attack caterpillars and a wide range of other insects including aphids; chalcid wasps, which parasitize eggs and larvae of many insect species; and tachinid flies, which parasitize a wide range of insects including caterpillars, beetle adults and larvae, and true bugs. Parasitoids are most effective at reducing pest populations when their host organisms have limited refuges to hide from them. Encarsia formosa, widely used in greenhouse horticulture, was one of the first biological control agents developed. Parasitoids are among the most widely used biological control agents. Commercially, there are two types of rearing systems: short-term daily output with high production of parasitoids per day, and long-term, low daily output systems. In most instances, production will need to be matched with the appropriate release dates when susceptible host species at a suitable phase of development will be available. Larger production facilities produce on a yearlong basis, whereas some facilities produce only seasonally. Rearing facilities are usually a significant distance from where the agents are to be used in the field, and transporting the parasitoids from the point of production to the point of use can pose problems. Shipping conditions can be too hot, and even vibrations from planes or trucks can adversely affect parasitoids. Encarsia formosa is a small predatory chalcid wasp which is a parasitoid of whitefly, a sap-feeding insect which can cause wilting and black sooty moulds in glasshouse vegetable and ornamental crops. It is most effective when dealing with low level infestations, giving protection over a long period of time. The wasp lays its eggs in young whitefly 'scales', turning them black as the parasite larvae pupate. Gonatocerus ashmeadi (Hymenoptera: Mymaridae) has been introduced to control the glassy-winged sharpshooter Homalodisca vitripennis (Hemiptera: Cicadellidae) in French Polynesia and has successfully controlled ~95% of the pest density. The eastern spruce budworm is an example of a destructive insect in fir and spruce forests. Birds are a natural form of biological control, but the Trichogramma minutum, a species of parasitic wasp, has been investigated as an alternative to more controversial chemical controls. There are a number of recent studies pursuing sustainable methods for controlling urban cockroaches using parasitic wasps. Since most cockroaches remain in the sewer system and sheltered areas which are inaccessible to insecticides, employing active-hunter wasps is a strategy to try and reduce their populations. Bacteria used for biological control infect insects via their digestive tracts, so they offer only limited options for controlling insects with sucking mouth parts such as aphids and scale insects. Bacillus thuringiensis, a soil-dwelling bacterium, is the most widely applied species of bacteria used for biological control, with at least four sub-species used against Lepidopteran (moth, butterfly), Coleopteran (beetle) and Dipteran (true fly) insect pests. The bacterium is available to organic farmers in sachets of dried spores which are mixed with water and sprayed onto vulnerable plants such as brassicas and fruit trees. Genes from B. thuringiensis have also been incorporated into transgenic crops, making the plants express some of the bacterium's toxins, which are proteins. These confer resistance to insect pests and thus reduce the necessity for pesticide use. If pests develop resistance to the toxins in these crops, B. thuringiensis will become useless in organic farming also. The bacterium Paenibacillus popilliae which causes milky spore disease has been found useful in the control of Japanese beetle, killing the larvae. It is very specific to its host species and is harmless to vertebrates and other invertebrates. A mammalian virus, the rabbit haemorrhagic disease virus was introduced to Australia to attempt to control the European rabbit populations there. It escaped from quarantine and spread across the country, killing large numbers of rabbits. Very young animals survived, passing immunity to their offspring in due course and eventually producing a virus-resistant population. Introduction into New Zealand in the 1990s was similarly successful at first, but a decade later, immunity had developed and populations had returned to pre-RHD levels. Lagenidium giganteum is a water-borne mould that parasitizes the larval stage of mosquitoes. When applied to water, the motile spores avoid unsuitable host species and search out suitable mosquito larval hosts. This mould has the advantages of a dormant phase, resistant to desiccation, with slow-release characteristics over several years. Unfortunately, it is susceptible to many chemicals used in mosquito abatement programmes. The legume vine Mucuna pruriens is used in the countries of Benin and Vietnam as a biological control for problematic Imperata cylindrica grass: the vine is extremely vigorous and suppresses neighbouring plants by out-competing them for space and light. Mucuna pruriens is said not to be invasive outside its cultivated area. Desmodium uncinatum can be used in push-pull farming to stop the parasitic plant, witchweed (Striga). The Australian bush fly, Musca vetustissima, is a major nuisance pest in Australia, but native decomposers found in Australia are not adapted to feeding on cow dung, which is where bush flies breed. Therefore, the Australian Dung Beetle Project (1965–1985), led by George Bornemissza of the Commonwealth Scientific and Industrial Research Organisation, released forty-nine species of dung beetle, to reduce the amount of dung and therefore also the potential breeding sites of the fly. In cases of massive and severe infection of invasive pests, techniques of pest control are often used in combination. An example is the emerald ash borer, Agrilus planipennis, an invasive beetle from China, which has destroyed tens of millions of ash trees in its introduced range in North America. As part of the campaign against it, from 2003 American scientists and the Chinese Academy of Forestry searched for its natural enemies in the wild, leading to the discovery of several parasitoid wasps, namely Tetrastichus planipennisi, a gregarious larval endoparasitoid, Oobius agrili, a solitary, parthenogenic egg parasitoid, and Spathius agrili, a gregarious larval ectoparasitoid. These have been introduced and released into the United States of America as a possible biological control of the emerald ash borer. Initial results for Tetrastichus planipennisi have shown promise, and it is now being released along with Beauveria bassiana, a fungal pathogen with known insecticidal properties. Many of the most important pests are exotic, invasive species that severely impact agriculture, horticulture, forestry and urban environments. They tend to arrive without their co-evolved parasites, pathogens and predators, and by escaping from these, populations may soar. Importing the natural enemies of these pests may seem a logical move but this may have unintended consequences; regulations may be ineffective and there may be unanticipated effects on biodiversity, and the adoption of the techniques may prove challenging because of a lack of knowledge among farmers and growers. Biological control can affect biodiversity through predation, parasitism, pathogenicity, competition, or other attacks on non-target species. An introduced control does not always target only the intended pest species; it can also target native species. In Hawaii during the 1940s parasitic wasps were introduced to control a lepidopteran pest and the wasps are still found there today. This may have a negative impact on the native ecosystem; however, host range and impacts need to be studied before declaring their impact on the environment. Cane toad (introduced into Australia 1935) spread from 1940 to 1980: it was ineffective as a control agent. Its distribution has continued to widen since 1980. Vertebrate animals tend to be generalist feeders, and seldom make good biological control agents; many of the classic cases of "biocontrol gone awry" involve vertebrates. For example, the cane toad (Rhinella marina) was intentionally introduced to Australia to control the greyback cane beetle (Dermolepida albohirtum), and other pests of sugar cane. 102 toads were obtained from Hawaii and bred in captivity to increase their numbers until they were released into the sugar cane fields of the tropic north in 1935. It was later discovered that the toads could not jump very high and so were unable to eat the cane beetles which stayed on the upper stalks of the cane plants. However, the toad thrived by feeding on other insects and soon spread very rapidly; it took over native amphibian habitat and brought foreign disease to native toads and frogs, dramatically reducing their populations. Also, when it is threatened or handled, the cane toad releases poison from parotoid glands on its shoulders; native Australian species such as goannas, tiger snakes, dingos and northern quolls that attempted to eat the toad were harmed or killed. However, there has been some recent evidence that native predators are adapting, both physiologically and through changing their behaviour, so in the long run, their populations may recover. Rhinocyllus conicus, a seed-feeding weevil, was introduced to North America to control exotic musk thistle (Carduus nutans) and Canadian thistle (Cirsium arvense). However, the weevil also attacks native thistles, harming such species as the endemic Platte thistle (Cirsium neomexicanum) by selecting larger plants (which reduced the gene pool), reducing seed production and ultimately threatening the species' survival. Similarly, the weevil Larinus planus was also used to try to control the Canadian thistle, but it damaged other thistles as well. This included one species classified as threatened. The small Asian mongoose (Herpestus javanicus) was introduced to Hawaii in order to control the rat population. However, the mongoose was diurnal, and the rats emerged at night; the mongoose therefore preyed on the endemic birds of Hawaii, especially their eggs, more often than it ate the rats, and now both rats and mongooses threaten the birds. This introduction was undertaken without understanding the consequences of such an action. No regulations existed at the time, and more careful evaluation should prevent such releases now. The sturdy and prolific eastern mosquitofish (Gambusia holbrooki) is a native of the southeastern United States and was introduced around the world in the 1930s and '40s to feed on mosquito larvae and thus combat malaria. However, it has thrived at the expense of local species, causing a decline of endemic fish and frogs through competition for food resources, as well as through eating their eggs and larvae. In Australia, control of the mosquitofish is the subject of discussion; in 1989 researchers A. H. Arthington and L. L. Lloyd stated that "biological population control is well beyond present capabilities". A potential obstacle to the adoption of biological pest control measures is that growers may prefer to stay with the familiar use of pesticides. However, pesticides have undesired effects, including the development of resistance among pests, and the destruction of natural enemies; these may in turn enable outbreaks of pests of other species than the ones originally targeted, and on crops at a distance from those treated with pesticides. One method of increasing grower adoption of biocontrol methods involves letting them learn by doing, for example showing them simple field experiments, enabling them to observe the live predation of pests, or demonstrations of parasitised pests. In the Philippines, early season sprays against leaf folder caterpillars were common practice, but growers were asked to follow a 'rule of thumb' of not spraying against leaf folders for the first 30 days after transplanting; participation in this resulted in a reduction of insecticide use by 1/3 and a change in grower perception of insecticide use. ^ Flint, Maria Louise & Dreistadt, Steve H. (1998). Clark, Jack K. (ed.). Natural Enemies Handbook: The Illustrated Guide to Biological Pest Control. University of California Press. ISBN 978-0-520-21801-7. Archived from the original on 15 May 2016. ^ Unruh, Tom R. (1993). "Biological control". Orchard Pest Management Online, Washington State University. Retrieved 8 November 2017. ^ "Biological Control: Harry Smith Fund". Archived from the original on 21 April 2017. Retrieved 2 March 2017. ^ "Inventory of the Paul H. DeBach Papers, 1921–1989 (bulk 1955–1980)". Online Archive of California. Archived from the original on 8 April 2017. Retrieved 7 April 2017. ^ DeBach P., Hagen K. S. (1964). P. DeBach (ed.). Manipulation of entomophagous species. Biological control of insect pests and weeds. Reinhold. pp. 429–458. ^ a b Peng, Shijiang (1983). "Biological Control – One Of The Fine Traditions Of Ancient Chinese Agricultural Techniques". Scientia Agricultura Sinica. 1: 92–98. Archived from the original on 2016-12-20. ^ a b "History and Development of Biological Control (notes)" (PDF). University of California Berkeley. Archived from the original (PDF) on 24 November 2015. Retrieved 10 April 2017. ^ "The Prickly Pear Story" (PDF). Department of Agriculture and Fisheries, Queensland. Archived (PDF) from the original on 10 June 2016. Retrieved 7 June 2016. ^ a b "What is Biological Control?". Cornell University. Archived from the original on 13 June 2016. Retrieved 7 June 2016. ^ "Classical Biological Control: Importation of New Natural Enemies". University of Wisconsin. Archived from the original on 13 June 2016. Retrieved 7 June 2016. ^ a b Follett, P. A.; Duan, J. J. (2000). Nontarget effects of biological control. Kluwer. ^ Huang, H. T.; Yang, Pei (October 1987). "The Ancient Cultured Citrus Ant". BioScience. 37 (9): 665–671. doi:10.2307/1310713. JSTOR 1310713. ^ "The Chinese Scientific Genius. Discoveries and inventions of an ancient civilization: Biological Pest Control" (PDF). The Courier: 24. October 1988. Archived (PDF) from the original on 4 March 2016. Retrieved 5 June 2016. ^ "How to Manage Pests. Cottony Cushion Scale". University of California Integrated Pest Management. Archived from the original on 30 April 2016. Retrieved 5 June 2016. ^ Caltagirone, L. E. (1981). "Landmark Examples in Classical Biological Control". Annual Review of Entomology. 26: 213–232. doi:10.1146/annurev.en.26.010181.001241. ^ "How to Manage Pests. Alfalfa". University of California Integrated Pest Management. Archived from the original on 25 May 2016. Retrieved 5 June 2016. ^ "Indian River Lagoon Species Inventory: Alternanthera philoxeroides". Smithsonian Marine Station at Fort Pierce. 1 December 2007. Archived from the original on 28 March 2017. Retrieved 9 April 2017. ^ "Salvinia (Salvinia molesta)" (PDF). CRC Weed Management. Archived (PDF) from the original on 24 September 2015. Retrieved 7 June 2016. ^ "A summary of research into biological control of salvinia in Australia" (PDF). ^ Chikwenhere, Godfrey P.; Keswani, C. L. (1997). "Economics of biological control of Kariba weed (Salvinia molesta Mitchell) at Tengwe in north-western Zimbabwe: a case study". International Journal of Pest Management. 43 (2): 109–112. doi:10.1080/096708797228780. ^ "Featured Creatures. European corn borer". University of Florida IFAS. Archived from the original on 30 May 2016. Retrieved 5 June 2016. ^ Kuris, Armand M. (March 2003). "Did biological control cause extinction of the coconut moth, Levuana iridescens, in Fiji?". Biological Invasions. 5 (1): 133–141. doi:10.1023/A:1024015327707. ^ a b "Augmentation: The Periodic Release of Natural Enemies". University of Wisconsin. Archived from the original on 17 March 2016. Retrieved 7 June 2016. ^ a b Hoddle, M. S.; Van Driesche, R. G.; Sanderson, J. P. (1998). "Biology and Use of the Whitefly Parasitoid Encarsia Formosa". Annual Review of Entomology. 43: 645–669. doi:10.1146/annurev.ento.43.1.645. PMID 15012401. ^ "Biological control. Phytoseiulus persimilis (Acarina: Phytoseiidae)". Cornell University. Archived from the original on 15 November 2015. Retrieved 7 June 2016. ^ Peter, K. V. (2009). Basics Of Horticulture. New India Publishing. p. 288. ISBN 978-81-89422-55-4. Archived from the original on 2017-04-07. ^ Shapiro-Ilan, David I; Gaugler, Randy. "Biological Control. Nematodes (Rhabditida: Steinernematidae & Heterorhabditidae)". Cornell University. Archived from the original on 15 December 2015. Retrieved 7 June 2016. ^ a b "Conservation of Natural Enemies: Keeping Your "Livestock" Happy and Productive". University of Wisconsin. Archived from the original on 18 March 2016. Retrieved 7 June 2016. ^ Gurr, Geoff M. (22 February 2016). "Multi-country evidence that crop diversification promotes ecological intensification of agriculture". Nature Plants. 2 (3): 16014. doi:10.1038/nplants.2016.14. PMID 27249349. ^ a b Ruberson, John R. (1999). Handbook of Pest Management. CRC Press. pp. 428–432. ISBN 978-0-8247-9433-0. Archived from the original on 2017-04-10. ^ Wilson, L. Ted; Pickett, Charles H.; Flaherty, Donald L.; Bates, Teresa A. "French prune trees: refuge for grape leafhopper parasite" (PDF). University of California Davis. Archived from the original (PDF) on 23 September 2016. Retrieved 7 June 2016. ^ Naranjo, Steven E. (8 June 2011). "Impacts of Transgenic Cotton on Integrated Pest Management". Journal of Agricultural and Food Chemistry. 59 (11): 5842–5851. doi:10.1021/jf102939c. PMID 20942488. ^ Acorn, John (2007). Ladybugs of Alberta: Finding the Spots and Connecting the Dots. University of Alberta. p. 15. ISBN 978-0-88864-381-0. ^ "Know Your Friends. Hover Flies". University of Wisconsin. Archived from the original on 4 June 2016. Retrieved 7 June 2016. ^ Kaya, Harry K.; et al. (1993). "An Overview of Insect-Parasitic and Entomopathogenic Nematodes". In Bedding, R.A. (ed.). Nematodes and the Biological Control of Insect Pests. CSIRO Publishing. pp. 8–12. ISBN 978-0-643-10591-1. Archived from the original on 12 May 2016. ^ "Biological control: Phasmarhabditis hermaphrodita". Cornell University. Archived from the original on 18 June 2016. Retrieved 15 June 2016. ^ "Glasshouse red spider mite". Royal Horticultural Society. Archived from the original on 14 June 2016. Retrieved 7 June 2016. ^ a b c "Biological Control of Two- Spotted Spider Mites". University of Connecticut. Archived from the original on 7 August 2016. Retrieved 7 June 2016. ^ Xuenong Xu (2004). Combined Releases of Predators for Biological Control of Spider Mites Tetranychus urticae Koch and Western Flower Thrips Frankliniella occidentalis (Pergande). Cuvillier Verlag. p. 37. ISBN 978-3-86537-197-3. ^ Castells, Eva; Berenbaum, May R. (June 2006). "Laboratory Rearing of Agonopterix alstroemeriana, the Defoliating Poison Hemlock (Conium maculatum L.) Moth, and Effects of Piperidine Alkaloids on Preference and Performance". Environmental Entomology. 35 (3): 607–615. doi:10.1603/0046-225x-35.3.607. ^ "European Gypsy Moth (Lymantria dispar)" (PDF). Archived from the original (PDF) on 17 May 2013. Retrieved 3 December 2017. ^ Davis, David E. (20 November 1957). "The Use of Food as a Buffer in a Predator-Prey System". Journal of Mammalogy. 38 (4): 466–472. doi:10.2307/1376399. JSTOR 1376399. ^ Lambert, Mark (September 2003). Control Of Norway Rats In The Agricultural Environment: Alternatives To Rodenticide Use (Thesis) (PhD). University of Leicester. pp. 85–103. ^ a b Wodzicki, Kazimierz (11 November 1973). "Prospects for biological control of rodent populations". Bulletin of the World Health Organization. 48 (4): 461–467. PMC 2481104. PMID 4587482. ^ Charter, Motti. "Using barn owls (Tyto alba erlangeri) for biological pest control in Israel" (PDF). World Owl Trust. Archived from the original (PDF) on 2017-11-11. Retrieved 11 November 2017. ^ Labuschagne, Lushka; Swanepoel, Lourens H.; Taylor, Peter J; Belmain, Steven R.; Keith, Mark (1 October 2016). "Are avian predators effective biological control agents for rodent pest management in agricultural systems?". Biological Control. 101 (Supplement C): 94–102. doi:10.1016/j.biocontrol.2016.07.003. ^ Zadoks, Jan C. (16 October 2013). Crop Protection in Medieval Agriculture: Studies in pre-modern organic agriculture. Sidestone Press. ISBN 9789088901874. Retrieved 11 November 2017 – via Google Books. ^ "How can I control rodents organically?". ATTRA - National Sustainable Agriculture Information Service. Retrieved 11 November 2017. ^ Kross, Sara M.; Bourbour, Ryan P.; Martinico, Breanna L. (1 May 2016). "Agricultural land use, barn owl diet, and vertebrate pest control implications". Agriculture, Ecosystems & Environment. 223 (Supplement C): 167–174. doi:10.1016/j.agee.2016.03.002. ^ "Barn Owl home range". The Barn Owl Trust. Retrieved 11 November 2017. ^ "Parasitoid Wasps (Hymenoptera)". University of Maryland. Archived from the original on 27 August 2016. Retrieved 6 June 2016. ^ Hawkins, B. A.; Thomas, M. B.; Hochberg, M. E. (1993). "Refuge Theory and Biological Control". Science. 262 (5138): 1429–1432. doi:10.1126/science.262.5138.1429. PMID 17736826. ^ a b Smith, S.M. (1996). "Biological control with Trichogramma: advances, successes, and potential of their use". Annual Review of Entomology. 41: 375–406. doi:10.1146/annurev.en.41.010196.002111. PMID 15012334. ^ Knoll, Valery; Ellenbroek, Thomas; Romeis, Jörg; Collatz, Jana (2017). "Seasonal and regional presence of hymenopteran parasitoids of Drosophila in Switzerland and their ability to parasitize the invasive Drosophila suzukii". Scientific Reports. 7 (40697): 40697. doi:10.1038/srep40697. PMC 5241644. PMID 28098183. ^ Sithanantham, S.; Ballal, Chandish R.; Jalali, S.K. ; Bakthavatsalam, N. (2013). Biological Control of Insect Pests Using Egg Parasitoids. Springer. p. 246. ISBN 978-81-322-1181-5. Archived from the original on 10 April 2017. ^ Hoddle M. S.; Grandgirard J.; Petit J.; Roderick G. K.; Davies N. (2006). "Glassy-winged sharpshooter Ko'ed – First round – in French Polynesia". Biocontrol News and Information. 27 (3): 47N–62N. ^ Smith, S. M.; Hubbes, M.; Carrow, J. R. (1986). "Factors affecting inundative releases of Trichogramma minutum Ril. Against the Spruce Budworm". Journal of Applied Entomology. 101 (1–5): 29–39. doi:10.1111/j.1439-0418.1986.tb00830.x. ^ Bressan-Nascimento, S.; Oliveira, D.M.P. ; Fox, E.G.P. (December 2008). "Thermal requirements for the embryonic development of Periplaneta americana (L.) (Dictyoptera: Blattidae) with potential application in mass-rearing of egg parasitoids". Biological Control. 47 (3): 268–272. doi:10.1016/j.biocontrol.2008.09.001. ^ Paterson Fox, Eduardo Gonçalves; Bressan-Nascimento, Suzete; Eizemberg, Roberto (September 2009). "Notes on the Biology and Behaviour of the Jewel Wasp, Ampulex compressa (Fabricius, 1781) (Hymenoptera; Ampulicidae), in the Laboratory, Including First Record of Gregarious Reproduction". Entomological News. 120 (4): 430–437. doi:10.3157/021.120.0412. ^ Huffaker, C. B.; Berryman, A. A.; Laing, J. E. (1984). "Natural control of insect populations". In C. B. Huffaker and R. L. Rabb (ed.). Ecological Entomology. Wiley Interscience. pp. 359–398. ISBN 978-0-471-06493-0. ^ Swan, L.A. (1964). Beneficial Insects. p. 249. ^ Lemaux, Peggy G. (2008). "Genetically Engineered Plants and Foods: A Scientist's Analysis of the Issues (Part I)". Annual Review of Plant Biology. 59: 771–812. doi:10.1146/annurev.arplant.58.032806.103840. PMID 18284373. ^ a b McGaughey, W. H.; Gould, F.; Gelernter, W. (1998). "Bt resistance management". Nat. Biotechnol. 16 (2): 144–6. doi:10.1038/nbt0298-144. PMID 9487517. ^ Kumar, PA; Malik, VS; Sharma, RP (1996). Insecticidal proteins of Bacillus thuringiensis. Advances in Applied Microbiology. 42. pp. 1–43. doi:10.1016/S0065-2164(08)70371-X. ISBN 9780120026425. PMID 8865583. ^ Neppl, Camilla (26 May 2000). "Management of Resistance to Bacillus thuringiensis Toxins". Archived from the original on 21 April 2017. ^ "Biological control: Paenibacillus popilliae". Cornell University. Archived from the original on 21 June 2016. Retrieved 15 June 2016. ^ Hall, I.M. ; Dunn, P.H. (1957). 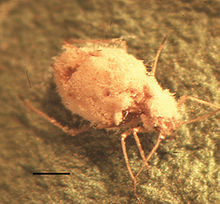 "Entomophthorous Fungi Parasitic on the Spotted Alfalfa Aphid". Hilgardia. 27 (4): 159–181. doi:10.3733/hilg.v27n04p159. ^ McNeil, Jim (2016). "Fungi for the biological control of insect pests". eXtension.org. Archived from the original on 26 May 2016. Retrieved 6 June 2016. ^ Fry, William E. (2012). Principles of Plant Disease Management. Academic Press. p. 187. ISBN 978-0-08-091830-3. ^ Santhosh, Kumar T.; Aparna, N. S. (2014). "Cordyceps Species as a Bio-Control Agent against Coconut Root Grub, Leucopholis coneophora Burm". Journal of Environmental Research and Development. 8 (3A): 614–618. ^ Capinera, John L. (October 2005). "Featured creatures: Peach Aphid". University of Florida – Department of Entomology and Nematology. University of Florida. Archived from the original on 26 May 2016. Retrieved 7 June 2016. ^ Li, Z.; Dong, Q.; Albright, T.P. ; Guo, Q. (2011). "Natural and human dimensions of a quasi-natural wild species: the case of kudzu". Biological Invasions. 13 (10): 2167–2179. doi:10.1007/s10530-011-0042-7. ^ Beard, Karen H.; O'Neill, Eric M. (2005). "Infection of an invasive frog Eleutherodactylus coqui by the chytrid fungus Batrachochytrium dendrobatidis in Hawaii". Biological Conservation. 126 (4): 591–595. doi:10.1016/j.biocon.2005.07.004. ^ Voigt K.; Marano, A. V.; Gleason, F. H. (2013). K. Esser & F. Kempken (ed.). Ecological & Economical Importance of Parasitic Zoosporic True Fungi. The Mycota: A Comprehensive Treatise on Fungi as Experimental Systems for Basic & Applied Research Vol. 11 Agricultural Applications (2nd ed.). Springer. pp. 243–270. ^ D'Amico, Vince. "Biological control: Baculoviruses". Cornell University. Archived from the original on 1 June 2016. Retrieved 15 June 2016. ^ Abrantes, Joana; van der Loo, Wessel; Le Pendu, Jacques; Esteves, Pedro J. (2012). "Rabbit haemorrhagic disease (RHD) and rabbit haemorrhagic disease virus (RHDV): a review". Veterinary Research. 43 (12): 12. doi:10.1186/1297-9716-43-12. PMC 3331820. PMID 22325049. ^ Strive, Tanja (16 July 2008). "Rabbit Calicivirus Disease (RCD)". Commonwealth Scientific and Industrial Research Organisation. Archived from the original (pdf) on April 15, 2014. Retrieved 8 April 2017. ^ Williams, David (26 May 2009). "Plan for 1080 drops in MacKenzie Basin". The Press. Retrieved 8 April 2017. ^ Kerwin, James L. "Biological control: Lagenidium giganteum". Cornell University. Archived from the original on 20 June 2016. Retrieved 15 June 2016. ^ "Factsheet – Mucuna pruriens". Tropical Forages. Archived from the original on 15 May 2008. Retrieved 21 May 2008. ^ Khan, Z.; Midega, C. A. O.; Amudavi, D. M.; Hassanali, A.; Pickett, J. A. (2008). "On-farm evaluation of the 'push–pull' technology for the control of stemborers and striga weed on maize in western Kenya". Field Crops Research. 106 (3): 224–233. doi:10.1016/j.fcr.2007.12.002. ^ Bornemissza, G. F. (1976). "The Australian dung beetle project 1965–1975". Australian Meat Research Committee Review. 30: 1–30. ^ Gould, Juli; Bauer, Leah. "Biological Control of Emerald Ash Borer (Agrilus planipennis)" (PDF). United States Department of Agriculture. Archived (PDF) from the original on 10 January 2011. Retrieved 28 April 2011. ^ Bauer, L.S. ; Liu, H.-P.; Miller, D.; Gould, J. (2008). "Developing a classical biological control program for Agrilus planipennis (Coleoptera: Buprestidae), an invasive ash pest in North America" (PDF). Newsletter of the Michigan Entomological Society. 53 (3&4): 38–39. Archived (PDF) from the original on 4 October 2011. Retrieved 29 April 2011. ^ "Biocontrol: Fungus and Wasps Released to Control Emerald Ash Borer". Science News. ScienceDaily. 26 April 2011. Archived from the original on 4 May 2011. Retrieved 27 April 2011. ^ Messing, Russell H.; Wright, Mark G. (2006). "Biological control of invasive species: solution or pollution?". Frontiers in Ecology and the Environment. 4 (3): 132–140. doi:10.1890/1540-9295(2006)004[0132:bcoiss]2.0.co;2. Archived (PDF) from the original on 2017-04-10. ^ National Research Council (1996). Ecologically Based Pest Management:New Solutions for a New Century. The National Academies Press. doi:10.17226/5135. ISBN 978-0-309-05330-3. Archived from the original on 2016-07-25. ^ "Biocontrol backfires again". Society for Conservation Biology. 2002. Archived from the original on 16 July 2011. Retrieved 31 July 2009. ^ Wright, M. G.; Hoffmann, M. P.; Kuhar, T. P.; Gardner, J; Pitcher, SA (2005). "Evaluating risks of biological control introductions: A probabilistic risk-assessment approach". Biological Control. 35 (3): 338–347. doi:10.1016/j.biocontrol.2005.02.002. ^ "Cane Toad". Exotic Animals – Major Pests. Northern Territory Government, Australia. Archived from the original on 15 March 2011. Retrieved 14 March 2011. ^ "The cane toad (Bufo marinus)". Australian Government: Department of the Environment. 2010. Archived from the original on 12 July 2016. Retrieved 2 July 2016. ^ Rose, K. E.; Louda, S. M.; Rees, M. (2005). "Demographic and evolutionary impacts of native and invasive insect herbivores: a case study with Platte thistle, Cirsium canescens". Ecology. 86 (2): 453–465. doi:10.1890/03-0697. ^ Havens, Kayri; Jolls, Claudia L.; Marik, Julie E.; Vitt, Pati; McEachern, A. Kathryn; Kind, Darcy (October 2012). "Effects of a non-native biocontrol weevil, Larinus planus, and other emerging threats on populations of the federally threatened Pitcher's thistle, Cirsium pitcheri". Biological Conservation. 155: 202–211. doi:10.1016/j.biocon.2012.06.010. ^ "Moving on from the mongoose: the success of biological control in Hawai'i". Kia'i Moku. MISC. 18 April 2012. Archived from the original on 19 June 2016. Retrieved 2 July 2016. ^ National Research Council (U.S.). Board on Agriculture and Natural Resources (June 2000). Incorporating science, economics, and sociology in developing sanitary and phytosanitary standards in international trade: proceedings of a conference. National Academies Press. p. 97. ISBN 978-0-309-07090-4. Archived from the original on 11 June 2013. Retrieved 12 August 2011. ^ "Gambusia Control". Archived from the original on 16 July 2016. Retrieved 2 July 2016. ^ Charlet, Larry. "The Impact of Pesticides on Natural Enemies". University of Wisconsin Department of Entomology. Archived from the original on 14 October 2014. Retrieved 9 April 2017. ^ Heong, K. L.; Escalada, M. M. (1998). "Changing rice farmers' pest management practices through participation in a small-scale experiment". International Journal of Pest Management. 44 (4): 191–197. doi:10.1080/096708798228095. Cowie, R. H. (2001). "Can snails ever be effective and safe biocontrol agents?" (PDF). International Journal of Pest Management. 47 (1): 23–40. CiteSeerX 10.1.1.694.2798. doi:10.1080/09670870150215577. Cook, R. James (September 1993). "Making Greater Use of Introduced Microorganisms for Biological Control of Plant Pathogens". Annual Review of Phytopathology. 31 (1): 53–80. doi:10.1146/annurev.py.31.090193.000413. PMID 18643761. U.S. Congress, Office of Technology Assessment (1995). "Biologically based technologies for pest control" (PDF). Ota-Env-636. Felix Wäckers; Paul van Rijn & Jan Bruin (2005). Plant-Provided Food for Carnivorous Insects – a protective mutualism and its applications. Cambridge University Press, 2005. ISBN 978-0-521-81941-1. Weeden, C. R.; Shelton, A. M.; Hoffman, M. P. Biological Control: A Guide to Natural Enemies in North America. Collier T.; Steenwyka, R. 2003. A critical evaluation of augmentative biological control. Economics of augmentation: 31, 245–256. Wikimedia Commons has media related to Biological pest control agents.